First-time Home Buyer? Relocating? Downsizing? Upgrading? Understanding your real estate goals and what fits your lifestyle are both key in finding your dream home. Hudson and his team understand the importance of listening to you. Finding the best property match starts with a firm understanding of your real estate goals, lifestyle and preferences in a home. Beyond finding the perfect fit, Hudson and his team are extremely skilled negotiators. We are your voice through the entire process, finding listings and tirelessly negotiating for the best price. We have you covered with expert advice, superior market awareness and exceptional negotiating skills. You can rest assured you have the right realtor team on your side. 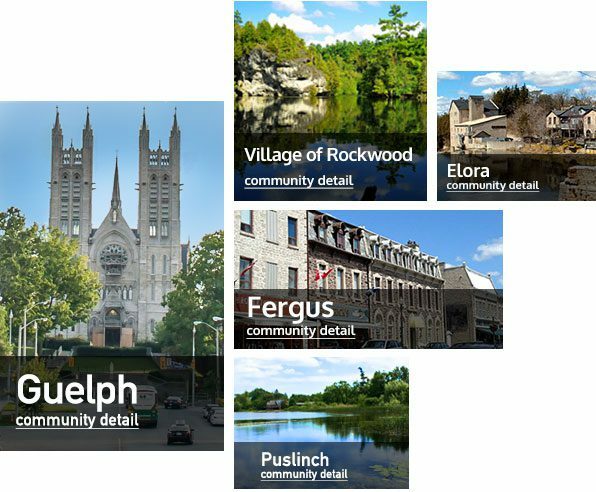 Search for all property listings in Guelph and surrounding area. Our search portal is directly tied into the Canadian Real Estate Association MLS listings so you can view all properties available on the market in real-time. Thinking about buying your first home? It’s an exciting time. Most people get caught up in the emotions of buying. It’s a good idea to understand property potential, resale value and all of your options. We guide you through the entire journey. Real estate in Guelph and the surrounding area. Guelph has been regularly voted one of the best places to live in Canada. The upmarket city with it’s surrounding townships of Puslinch, Fergus, Elora and the Village of Rockwood are renowned for their picturesque beauty. Guelph provides a small town feel but with big city amenities, ample community spirit, a strong work force and a thriving education sector boosting one of Canada’s top 20 universities. Living in Guelph for more than 30 years and in the real estate industry for over a decade. Hudson Smith has an extensive knowledge of the city of Guelph and it’s surroundings. This comprehensive awareness of the real estate market coupled with proven expertise, puts Hudson and his team in a prime position to find your perfect property. Service that takes into account your goals while minimizing risk. Hudson Smith provides a tailored service that takes into account your goals while minimizing risk; take a look at Hudson’s ‘for sale’ properties and you can expect an honest account what each property has to offer. Search all property listings in Guelph and surrounding area directly form our site (updated in real-time so you don’t miss a listing). Hudson will handpick properties for you to consider, based on your situation and price range. When you choose to buy real estate through Hudson Smith, you’ll benefit from expert knowledge and advice, as well as superior negotiating skills. Experience the difference a first-class realtor brings to the house-buying process. Hudson brings a wide array of skills to the table including listening to your real estate needs and wants. Gathering specific key information ultimately leads to finding your dream home. Hudson and his team are extremely skilled negotiators that work tirelessly negotiating for the home you want at the best price. Put us to work for you!